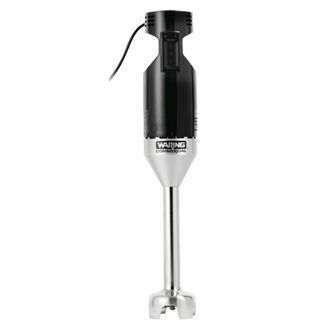 Efficient and with a sturdy 175W motor, the Waring Light Duty Quik Stix Stick Blender is a versatile and lightweight time saving hand blender, suitable for light commercial applications. Ideal for use in cafés, residential homes, bars and even the home, the high efficiency variable speed motor can blend up to 11.4 litres of fruit, vegetables and other ingredients at a time. Make perfect soups, dressings, smoothies, puree, pesto and many other dishes with this impressive compact immersion blender.